Thank you for the link to our obituary and for publishing your friend’s heartfelt tribute. Ed and Andreas. 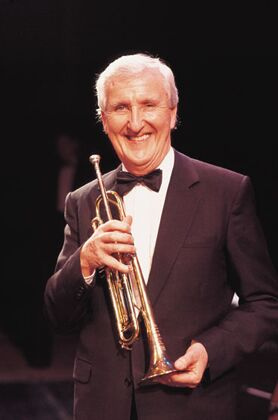 I played with Pat just the once when he & I were guests with the Savannah Jazz Band in the early 1990’s at the” Wheel ” Colcar, Huddersfield, Yorkshire UK. A magic memory, he really was someone special. Thanks for that, Taff. I know Chris Barber is aware of this post via his website and that he would appreciate your words. I’m pleased to be a friend on FaceBook and also join your group, Kindest Regards, Taff. Thanks so much for that, Taff. If you are referring to the photo you posted on Jazzers of you and Pat, I have already downloaded it for my photo library. If another photo I’d be pleased to see it. I’d be very interested to see your photos with Gregg Stafford. I met both Gregg and Dr Michael White in New Orleans during the French Quarter Festival in 2010. I painted portraits of them both playing at a gig in Dew Drop Hall (http://www.jazzandjazz.com/?p=1914 / http://www.jazzandjazz.com/?p=1932). In fact I sold two of my fine art prints of Gregg, which I produce myself, to fans of his in New Orleans over Christmas. I look forward to hearing from you again on Jazz&Jazz and Jazzers. In fact there’s always a lot going on on Jazzers which I launched last year, so do join in the debates and discussions about jazz. To which email address shall I send the photos I have with & Greg Stafford ? “Now I say this, brethren, that flesh and blood cannot inherit the kingdom of God; nor does the perishable inherit the imperishable. Behold, I tell you a mystery; we will not all sleep, but we will all be changed, in a moment, in the twinkling of an eye, at the last trumpet; ,for the trumpet will sound, and the dead will be raised imperishable, and we will be changed. For this perishable must put on the imperishable, and this mortal must put on immortality. But when this perishable will have put on the imperishable, and this mortal will have put on immortality, then will come about the saying that is written, “DEATH IS SWALLOWED UP in victory. “O DEATH, WHERE IS YOUR VICTORY? O DEATH, WHERE IS YOUR STING?” The sting of death is sin, and the power of sin is the law; but thanks be to God, who gives us the victory through our Lord Jesus Christ. There is hope in Jesus, eternal hope! Jonny, Thank you so much for posting those scriptures and brave words of encouragement for Pat’s family and friends. I share your faith. I only learnt last night of the death of Pat Halcox and it was Russell Gilbrook who told me. Russell and I have been friends for over 25 years due to our shared interest in rock music and when Russell joined Chris Barber in 1990 I went to see him play at home and abroad at every opportunity. And of course I got to know the band too. They were all, without exception, lovely people. Pat Halcox had a hugely kind heart and was a very sympathetic listener and a man of great moral integrity. He did believe in God and when I gave him a copy of the Quran he was later kind enough to tell me that he liked “the book”. One evening after a concert in Holland Pat, Russell and I went in search of something to eat and I think we ended up at a kebab shop. That half-hour together was the sweetest of moments – listening to Pat and his views on life. See you again one day. Pat Halcox was very talented and he had a lovely tone. Such a great trumpet player and I miss him ever so much. Pat was always very friendly and I always had nice times chatting to him at concerts.